The Solana HSV 1+2/VZV Assay is a multiplex in vitro diagnostic test for the detection and differentiation of Herpes simplex virus type 1 (HSV-1), Herpes simplex virus type 2 (HSV-2), and Varicella-zoster virus (VZV) nucleic acids isolated and purified from cutaneous or mucocutaneous swab specimens obtained from symptomatic patients. The Solana HSV 1+2/VZV Assay consists of two major steps: (1) specimen preparation, and (2) amplification and detection of target sequence specific to HSV-1, HSV-2 and/or VZV using isothermal Helicase-Dependent Amplification (HDA) in the presence of target-specific fluorescence probe. Using HDA technology the target sequences are amplified by HSV-1, HSV-2 and/or VZV specific primers and detected by HSV-1, HSV-2 and/or VZV specific fluorescence probes included in the Reaction Tube. A competitive process control (PRC) is included in the Process Tube to monitor sample processing, inhibitory substances in clinical samples, reagent failure or device failure. The PRC target is amplified by specific primers and detected by a PRC specific fluorescence probe. 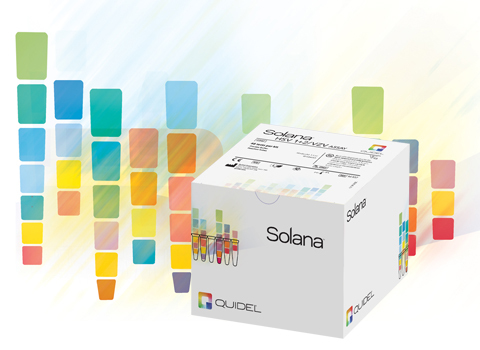 Results are displayed on the touchscreen, can be saved to the instrument, printed, and are capable of being sent to the LIS and exported through one of Solana’s five USB ports. Solana HSV 1+2/VZV is also supported by the power of Virena®. Cutaneous or mucocutaneous lesion samples obtained from symptomatic patients suspected of active herpes simplex virus type 1, herpes simplex virus type 2 and/or varicella-zoster infection. Room temperature (up to 30 °C) for up to 48 hours, 2° to 8°C or –20°C for up to 7 days prior to processing.